So Quiet Soundproofing is the Canadian authorized reseller of Audimute’s AcoustiColor® Acoustic Wall Tiles. These acoustic tiles are a cost efficient and customizable sound absorption solution. Coated in one of the many color options available via Sherwin Williams, these AcoustiColor tiles will look great in your space and will improve your sound quality. Select a color above that will blend naturally into your existing décor or a bold color to stand out in your environment. The rigidity of this Acoustic Tile allows it to adhere to the wall like our panel without a metal frame. Audimute’s AcoustiColor Tiles are made from a blend of recycled cotton and cellulose most of which comes from post-consumer newspapers. Our Acoustic Wall Tiles are effective sound absorbers. 1.5″ panels offering an NRC rating of .95, these panels are excellent for mid to high range frequency sound absorption. These AcoustiColor Wall Tiles will effectively reduce echo and reverberation in homes, classrooms, theaters, restaurants and any other space that needs a noise reduction solution. For commercial spaces such as gymnasiums, weight rooms, exhibition areas, and other high traffic areas in need of large wall applications, try our half-inch AcoustiColor tiles with a NRC rating of .55. These tiles are thinner and denser than the other thicknesses, making them much more durable, and can be purchased in the same standard and custom sizes for full wall acoustic coverage. Every AcoustiColor® product purchase includes an AcoustiColor Touch Up Kit, because bumps and dings happen. This all-in-one paint touch-up kit is specially formulated to provide long-lasting repairs to small nicks, scratches, and chips with a simple squeeze of the enclosed bottle. The relationship between durability and absorption, and the role this plays when selecting the best Acoustic Tile option for your space, is often misunderstood. 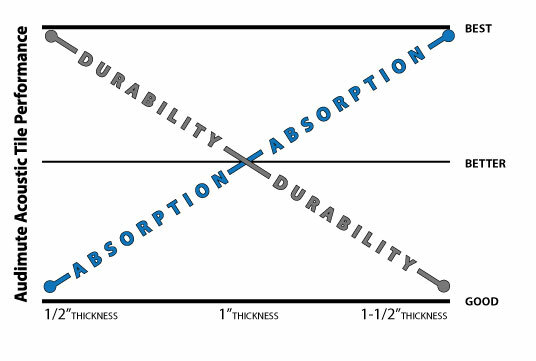 The graph below illustrates how product thickness affects both durability and acoustic performance. When selecting the right product, it’s important to consider the area that you are treating. Will your Acoustic Tiles be placed in a high-traffic area? If yes, one of our more durable Acoustic Tile thicknesses may be a better option to consider. Still have questions? Contact one of our Acoustic Specialist today. Known for its natural bands of texture playing throughout, the final appearance of AcoustiColor® products have normal irregularities that are considered part of the appeal. Variations in the appearance of texture and shading for example, create a distinctively interesting character that makes AcoustiColor so unique. This product delivers the aesthetics of rustic natural stone; therefore, variations are both normal and desirable. Key characteristics are a dense yet porous fine-grained appearance. Each piece is unique with textures occurring naturally.